This is a shiny-new update of a monster storytime that I posted about several years ago. This week’s storytime is all about monsters (but ONLY the friendly, cute and cuddly kind!) If you are trying to avoid a Halloween theme, but are looking for something other than pumpkins, this is a fun theme to try out. Monsters galore, can you roar? Roar. Monsters galore, can you soar? Make flying motions. Monsters galore, please shut the door. Clap hands. Monsters galore, fall on the floor! Fall down. Leonardo is a terrible monster because no matter how hard he tries, he can’t seem to scare anyone! This is a large book with large pictures – great to read to a crowd! I heard this played on the radio and haven’t been able to get this catchy tune out of my head! The whole song is full of fun actions to follow as you pretend to be a monster. Paws up on your head. And you….can be a monster too! Flap your wings like this. Oh! You don’t have wings? And you…can be a monster too! Growl and show your fangs. Teeth will have to do…. This book is a tried-and true-favorite starring Grover. 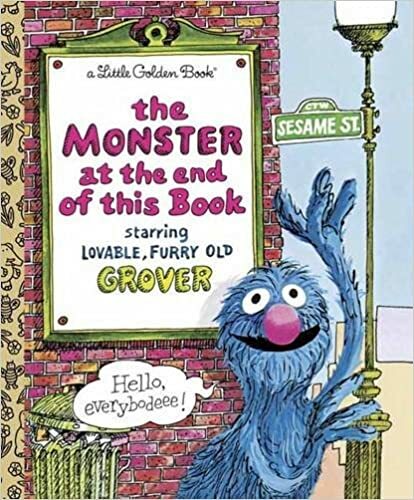 Grover is so scared that there is a monster at the end of the book and begs you not to turn each page. It ends with him finding out that he is the monster at the end of the book….giggle. In the app, Grover reads to you, which is a fun change of pace. I also like that the app makes an “old” book feel “new” again. 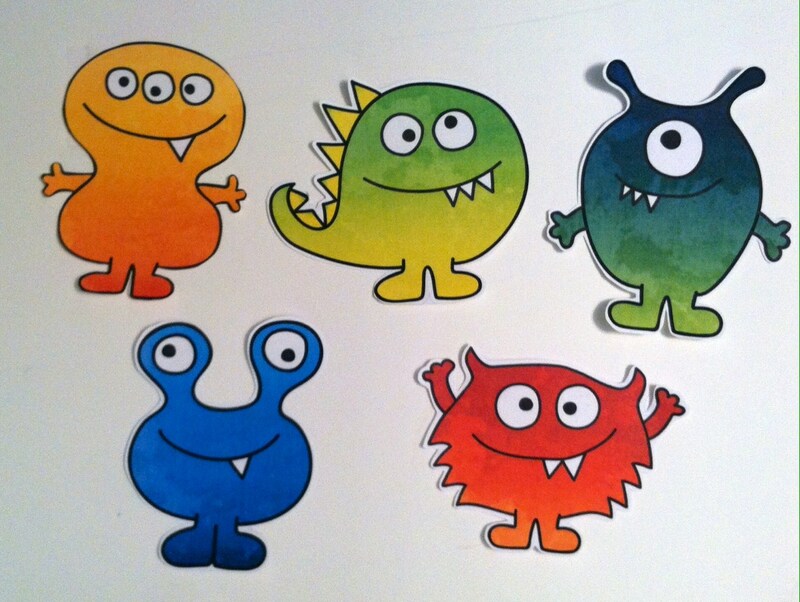 I used these adorable, printable monsters that Kate from picklebums.com created for her little one who is afraid of monsters. Read her post about using these guys to help allay monster fears! Start with all five monsters on your felt/magnet board, and remove one with each verse. This is a good activity for getting out some energy as it requires lots of jumping! FOUR little monsters jumping on the bed…..
THREE little monsters jumping on the bed…..
TWO little monsters jumping on the bed….. This is my perfect mash-up of Ed Emberley’s Go Away Big Green Monster and Josie Bissett’s Tickle Monster! As you tickle away the monster’s horns, arms, legs, etc., they become every-day objects such as the moon, a tree, or a car. 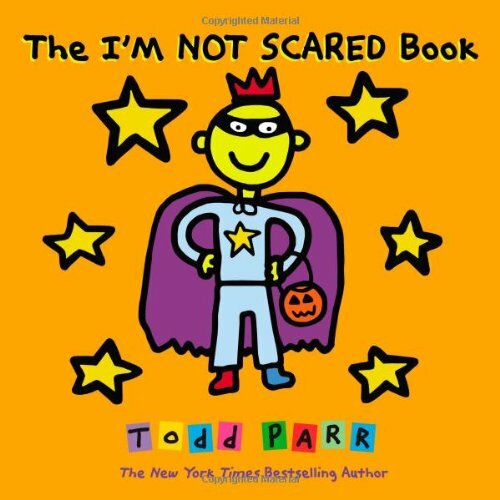 An interactive book that encourages children to face their fears of monsters in a fun way, is a winner in my book! This activity comes from Fun with Friends at Storytime and Mollie posted about it previously in our Milk and Cookies Storytime. You can find a monster face by doing a google image search for cookie monster face clipart. If you want the kids to participate, you can cut circles out of different colored paper and spread the “cookies” around the room. As you say each color, have them bring the cookies up to feed cookie monster. Cookie Monster wants a yummy cookie treat. Please bring him a red, cherry cookie to eat. Please bring him a blue, blueberry cookie to eat. Please bring him a pink, watermelon cookie to eat. Please bring him a green, green apple cookie to eat. I once worked with a veteran storytimer who always brought masks to storytime this time of year. She would put them on and take them off, while reassuring the kids that she was still herself – even with the mask on. Then she would let the kids try on the masks too (or try them on their parents/caregivers) as a way of teaching them not to be afraid. If you own any masks (that aren’t very scary of course! ), this could be a nice lead-in to the monster mask craft. These awesome masks came from Sarah at Awesome Storytime. I made a quick template that you can get here: Monster Mask. I’m particularly fond of this story as a digital app; there’s something magical about the way the monster disappears on the screen. If you aren’t able to use the app, you can’t go wrong with the book – it’s a classic. This story also makes a great flannel board. So versatile! Five itty bitty monsters lying underneath the bed. 1 itty bitty monster, lying underneath the bed. Have fun dancing to this classic! We alternated between making scary faces and “claws” à la Thriller, walking like Frankenstein, and doing the twist. Children must be sitting with parents/caregivers for this book….because it requires lots of tickling! 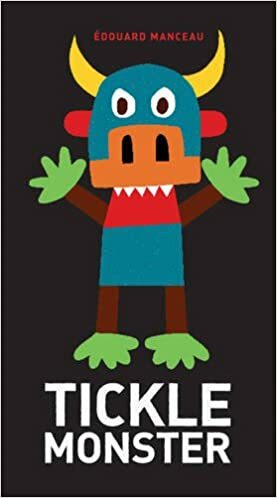 Tickle Monster is one of my all-time favorite books. It gets parents/caregivers interacting with their children during storytime – and it will elicit tons of giggles from your group! This is a story about Bernadette, who likes to do some very un-monsterly things – like picking flowers and petting kittens. 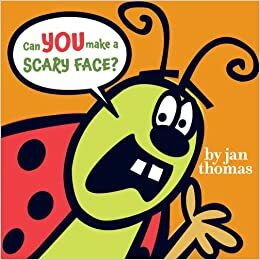 While this is not about monsters, it a good book for practicing your scary faces so that you can scare away all of the monsters! 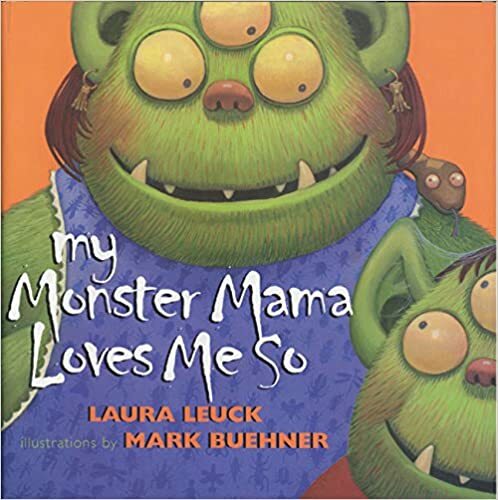 A sweet, funny book about how much a monster mama loves her little one. I’m doing a monster storytime tomorrow. Thanks for the suggestions! I feel a little apprehensive to do ‘monsters’ with toddlers, specially when it comes to telling them the monster was under the bed… But we will definitely try it with an older group….Any feedback on how it turned out? If you don’t feel comfortable doing monsters as a theme, then use your best judgement and skip it! You know your group better than anyone else. I was careful to choose books and activities with “happy” monsters and not scary monsters. Leonardo is a monster who can’t scare anybody, the Tickle Monster makes children laugh by tickling them, and the little monster in the “itty bitty monsters” song is scared to be alone. Another great book to use is “Go Away Big Green Monster” by Ed Emberley which is designed to help children overcome their fear of monsters. Children can practice saying “Go Away Big Green Monster,” as page by page the monster disappears. 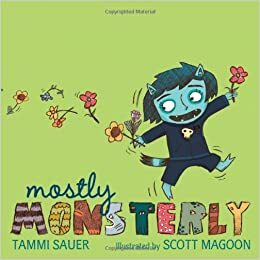 I think reading books and talking about friendly monsters can be beneficial for children and help them overcome any fear that they might have – but again, do what you feel comfortable with! 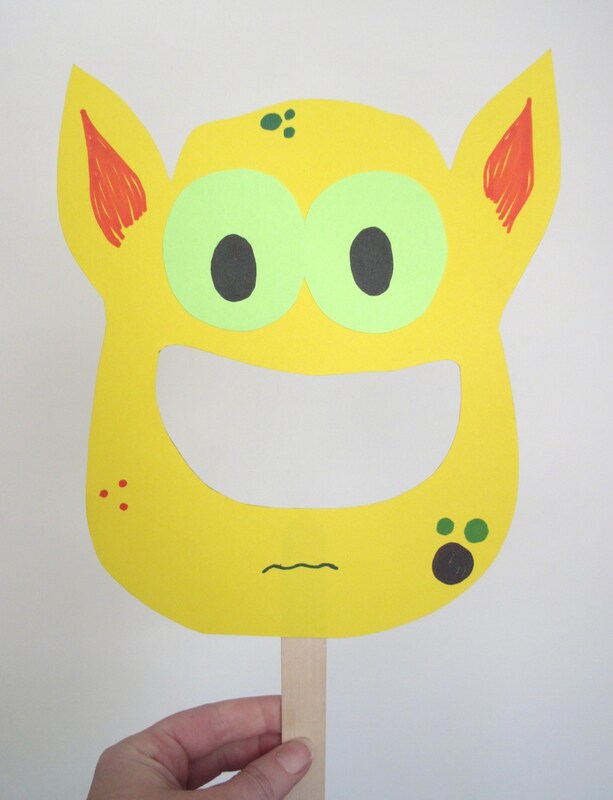 This craft project was a HUGE hit when we did a monster story time. Kids loved it! 1) I cut out the mouth interiors as one piece, then cut them in two, gave each a jagged edge, and they became monster teeth, taped on from the back of the mask to show through the mouth whole. 2) We had some scraps of red felt, which I cut into strips, and those became tongues, sticking out from the mouth. 3) I cut the extra scraps from the template card stock into triangles, and some kids added those as horns. Oh I love how these turned out! Thanks for sharing your pictures! Great craft! Thanks for the template!